World attention has turned to the Coptic Christian community of Egypt, following the beheading of 20 of their migrant workers in Libya at the hands of the so-called Islamic State. The Coptic Orthodox Church considers them martyrs. A new icon venerates their death and their names have been added into the Synaxarion, the liturgical church history commemorating the saints. But who are the Copts, and what is their understanding of martyrdom? The word ‘Copt’ derives from the Pharaonic word ‘gypt’, which through the Greek ‘Aigyptus’ became the modern-day ‘Egypt’. Copts are therefore Egyptians, descendants of the ancient Pharaonic civilization. As such, the Orthodox, Protestant, and Catholic Egyptians call themselves Copts, as do some Muslims. Coptic population figures are highly contested. Some Muslims estimate as low as 3-4 percent; some Christians as high as 20-25 percent. The CIA world factbook estimates 10 percent. Official Egyptian ID cards list the religion of every citizen, but these figures are not released. Roughly 90 percent of Copts belong to the Orthodox denomination. Coptic tradition says the church was planted through the missionary preaching of St. Mark, writer of the second Gospel in the New Testament. He was martyred in Alexandria in 68 AD. The Coptic Orthodox Church dates its calendar from the year 248 AD, the first year of Roman Emperor Diocletian. His reign witnessed up to 800,000 Christian martyrs in Egypt. According to Islamic tradition, Muhammad said that after conquering Egypt [649 AD] the Muslims should treat its inhabitants well. To come under the protection of the new rulers Copts had to pay the jizya tax. Those unable had to either convert or risk death. Historian Phillip Jenkins, author of The Lost History of Christianity, says that periods of persecution waxed and waned until the end of the 12th century, when Islam became the dominant religion. Islam considers a martyr to be one who is killed while striving in the path of God, often interpreted as participation in jihad. In Christianity, the early church defined martyr as a technical term to mean one who was put to death for their faith, in imitation of Jesus. Christology was an issue that divided Coptic Orthodoxy from emerging Roman Catholicism. In 451 AD at the Council of Chalcedon the Copts were anathematized over the issue, but in 1998 the two churches reconciled. Copts prefer to be known as ‘miaphysites’, where Jesus’ humanity and divinity unite to make one nature. In many issues the Coptic Orthodox are similar to Roman Catholics, following a traditional liturgy, holding to seven sacraments, and believing that during Eucharist the bread and wine become Jesus’ actual body and blood. They differ in that the Copts have their own patriarch. Pope Tawadros II is the 118th in a line stretching back to St. Mark. Coptic priests are free to marry, though bishops must be celibate and are drawn from monastic communities. 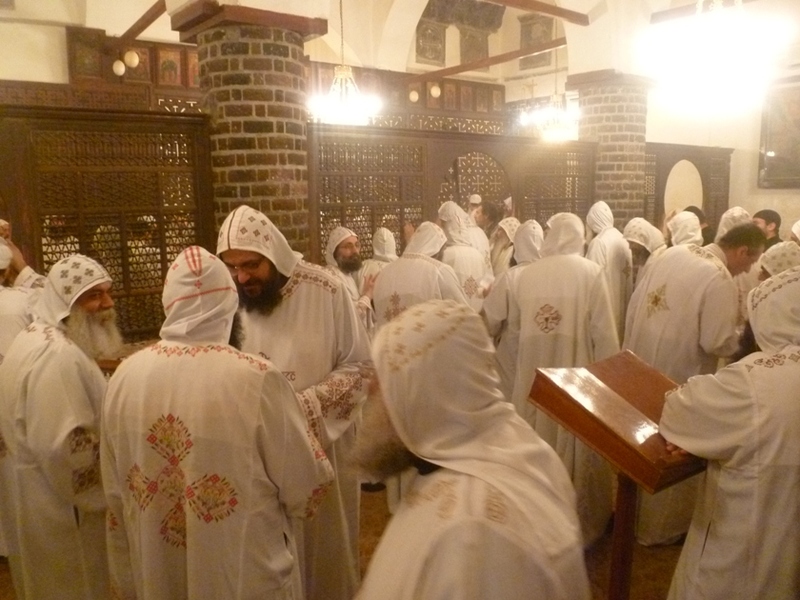 Coptic ascetic spirituality is exhibited through the practice of fasting. But unlike complete abstinence as in Islam’s Ramadan, faithful Copts maintain a vegan diet while fasting 210 days of the year. Monasticism as a Christian expression is traced back to St. Anthony in the Third century. St. Benedict and John Cassian visited the Egyptian desert monks and introduced the practice to Europe. Being a bishop-led church independent from Rome has also contributed to close relations with the Anglican Church in the UK. According to Heather Sharkey, author of American Evangelicals in Egypt, the Church Missionary Society worked to revive the Orthodox Church in the Nineteenth century, as opposed to US Presbyterians from whom most of today’s Egyptian Protestants are descended. Competition between denominations has often led to tension, but especially since the Arab Spring Copts have deemphasized distinctions in light of the challenges of Islamism. It has also resulted in a surge in spirituality. The late Pope Shenouda III encouraged biblical literacy and winsome preaching. Today the Bible Society of Egypt is the fourth largest in the world. Over the past 30 years the Coptic Orthodox Church has spread throughout the world, establishing over 15 dioceses in Europe, Australia, and the Americas. Commenting on the martyrs in Libya, Bishop Angaelos of the UK demonstrates Coptic—and biblical—spirituality. This article was first posted at Lapido Media.